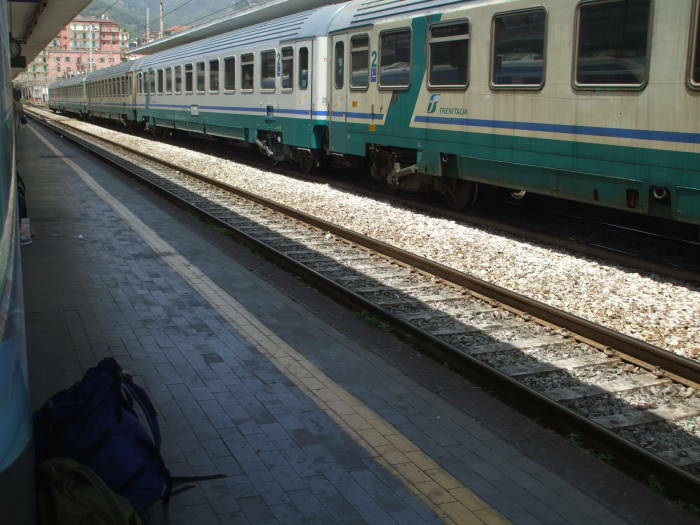 Trains are an easy, fast, and pretty cheap way to get around Italy. 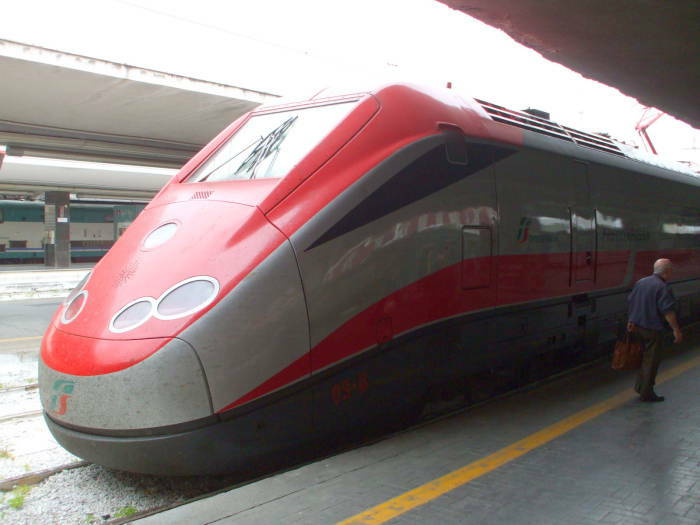 Here are two examples of the Freccia Rossa or Red Arrow high-speed train, running at speeds up to 300 kilometers per hour on the Rome-Milan line. Do not buy your tickets in advance through an overseas travel agent! 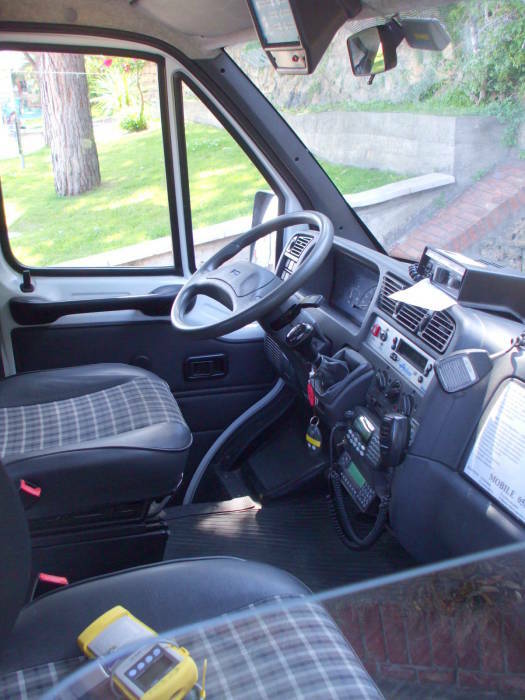 You would lose flexibility and pay quite a bit in fees and surcharges and baksheesh and commission. 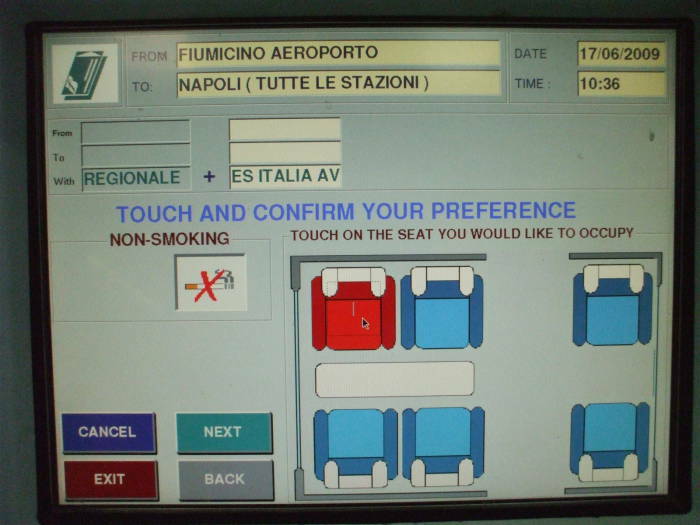 There will be some touch-screen data terminals where you can buy tickets and change existing reservations. You can also use these to explore scheduling possibilities by going through the process of making a reservation but then exiting without paying, cancelling the transaction and reservation. We will start with the initial screen. 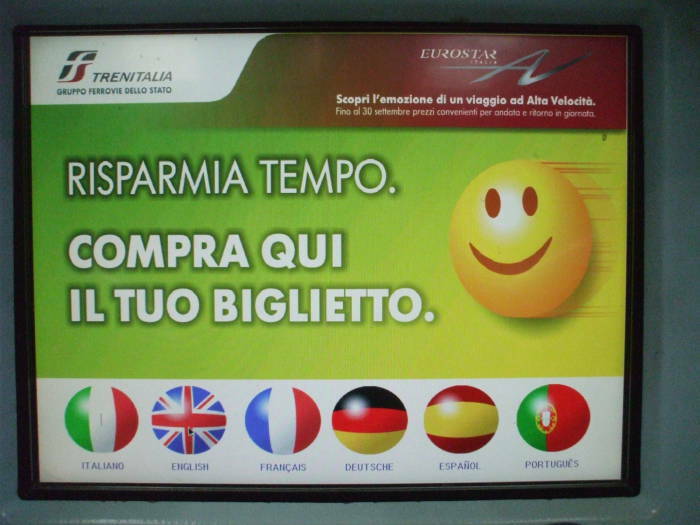 You have your choice of six languages: Italian, English, French, German, Spanish, and Portuguese. Pick your language. Pick ticket issue if you are buying a new ticket or investigating schedules. Notice that you could also change existing reservations, and print and pick up tickets for reservations made on-line. 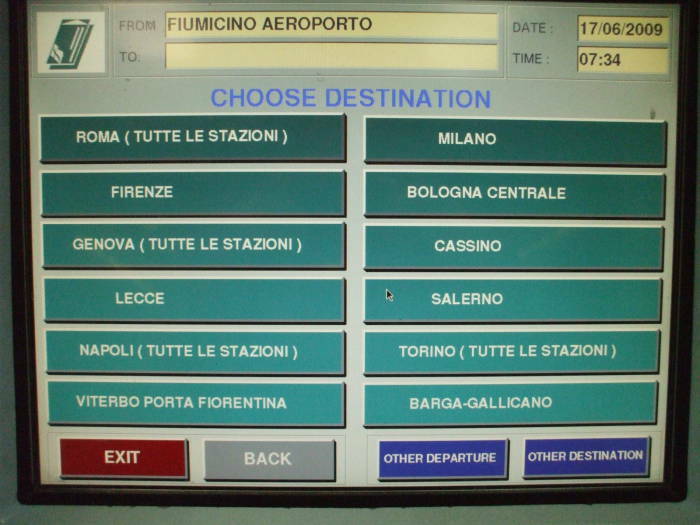 It immediately offers the twelve most commonly chosen destinations for trips from the station at which you are purchasing (I took these pictures at the rail station at Rome's Fiumicino airport). To go to any other destination, pick other destination. You can then easily choose from lists or from typing the first part of the name of your destination. 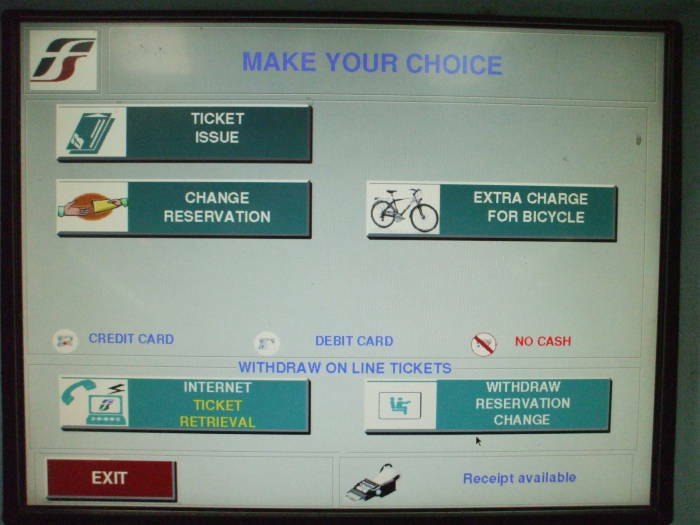 By default it will assume that you are buying a ticket to leave from the station at which you are purchasing. If you are buying tickets here to depart from a different station, probably an uncommon event, pick other departure. Do realize that Italians speak Italian and they refer to their cities by the real names, not the different names used by English speakers. 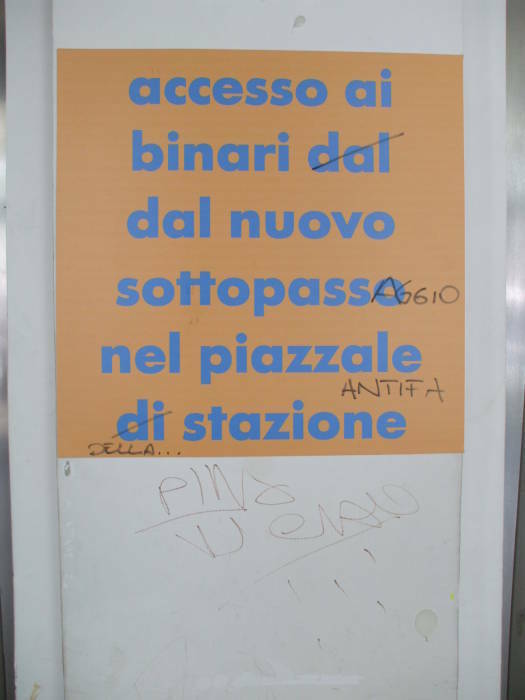 Also, "Tutte le stazioni" means "All stations (in that city)". The most common choices are easy to make: today or tomorrow, and it's nearly as easy to select a later date. This is Europe, you will have a lot of choices! Here are the next four trains, notice that there is a train every hour. Press --> to go to the next block of four choices. Select the train you want. Now you can select your seat type. Next to someone who made their reservation earlier, in a seat of your choice, or anything goes. This is the case for trains with reserved seats. Some short-range regional trains have open seating, you take any available seat on a car of the appropriate class. 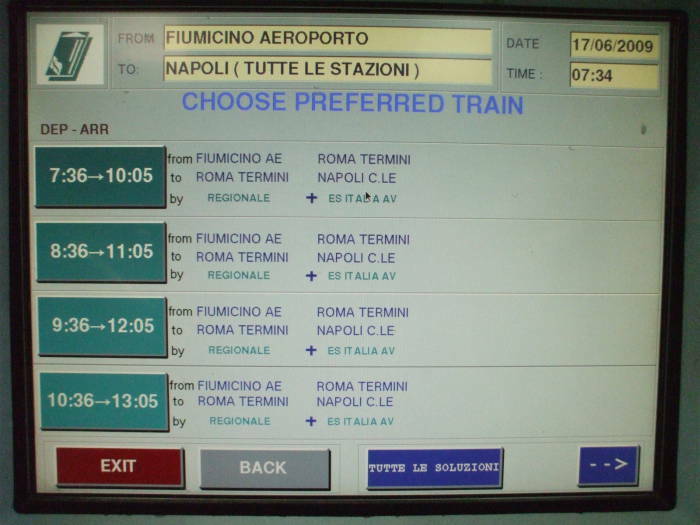 Notice in the upper part of the display, the planned trip from Fiumicino Aeroporto to Napoli will require two trains: a regionale with open seating from the airport to Roma Termini, and then one with reserved seating from Roma to Napoli. Now you can select your seat. If your itinerary involves a change of trains along the way, you can select the seats for each one. When you have everything set up the way you want it, insert a credit card to pay. Your tickets will be printed and dispensed by the machine. Now that you have your tickets, you must be responsible for validating your ticket and getting yourself onto the train. Americans are accustomed to constant booming announcements on overhead loudspeakers, reminding you every few minutes of what to do, and not to accept any candy or luggage from strangers, and not to lose your own luggage, and not to fall off the platform onto the tracks, and on and on. Really, public transportation in the U.S. treats the American traveler like an accident-prone and rather dim-witted child, maybe with some reason. You are expected to be able to figure out that it is for train #9374, leaving at 12:44. Lots of automated signs in the stations and on the platforms will tell you at which platform you should board. 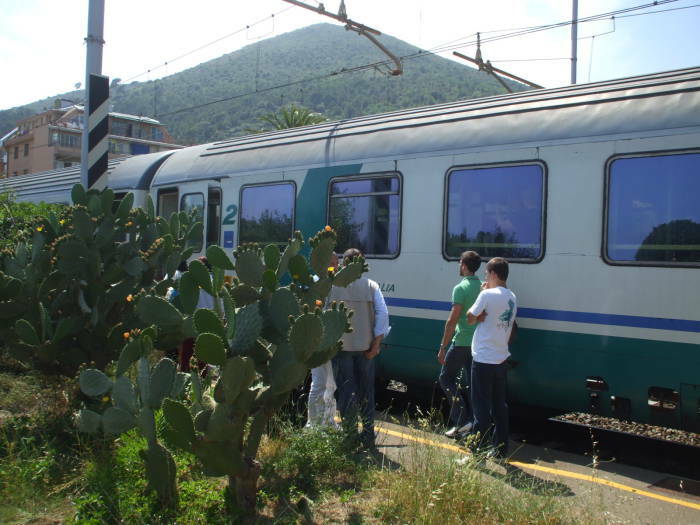 Once the train is there, you should get into car number 6 and look for seat number 31 (which happens to be next to a window, finestrino). 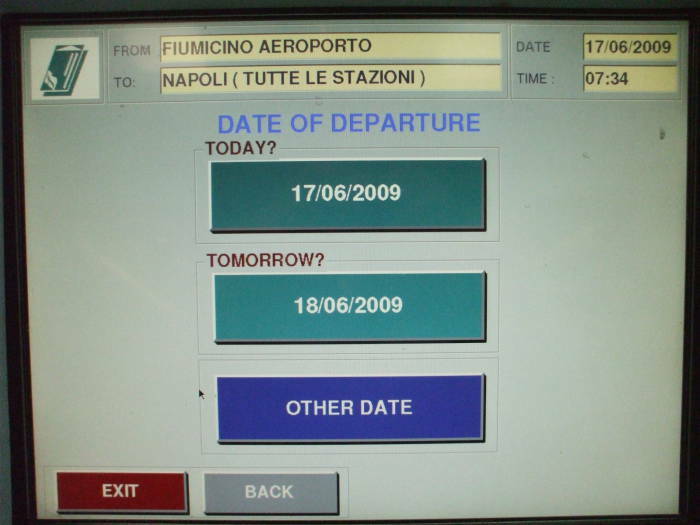 However, before boarding the train you must validate your ticket by inserting it into any of the many ticket validating machines in the station and on the platform. That will print a date and time stamp across one end (see the right end of this ticket) and will show that you are committed to using the ticket, you are not trying to ride for free and then cash in an apparently unused ticket. Adult Supervision will not be there to help you. The first official you will see will be the conductor on board the train checking to see that you are in the right seat of the right train with a validated ticket. Compare this to Amtrak in the U.S., where you cannot even get to the boarding door without showing your ticket to three railway workers who each tell you what to do next. 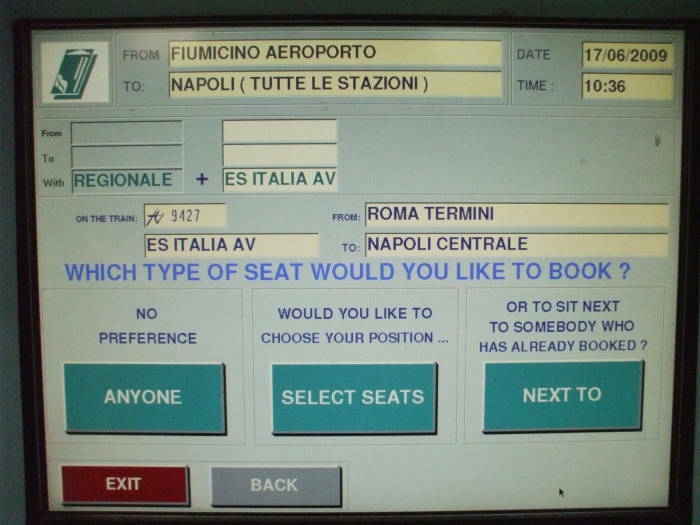 For more details on Italian trains, trip planning, ticketing, ask The Man in Seat 61. These two pictures are from Roma Termini, the main rail station in Rome (or Roma in Italian). 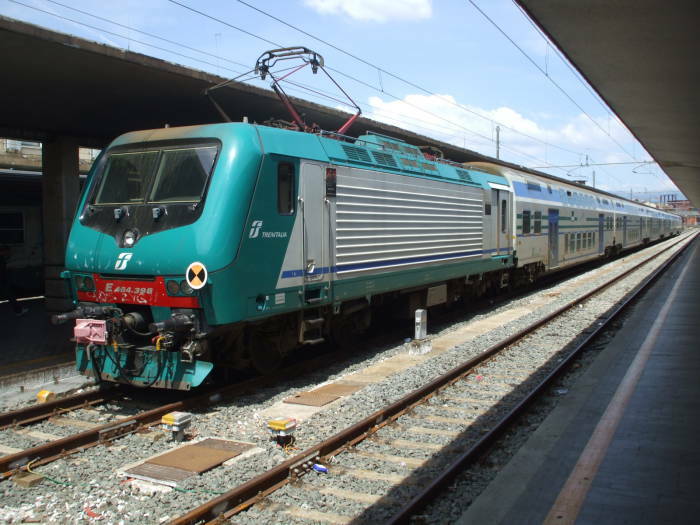 These are typical intercity trains, used for trips of an hour or two. 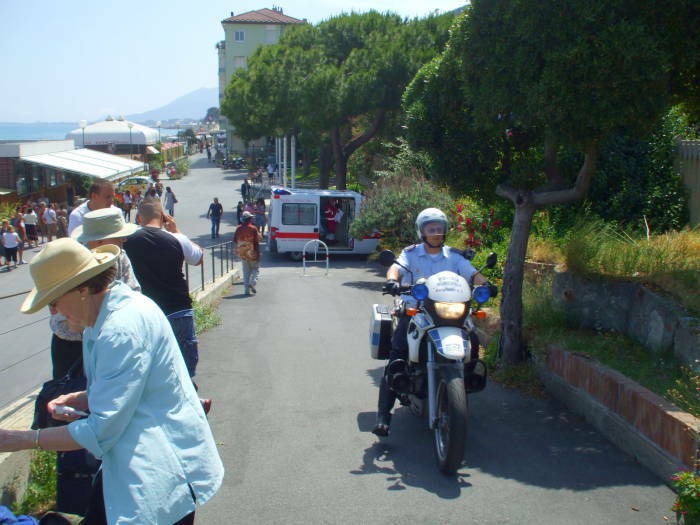 These two pictures are from Salerno's station. 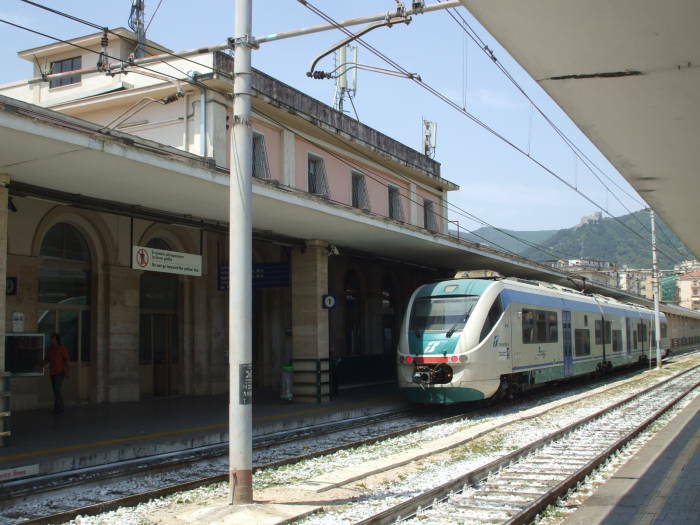 Salerno has a lot of trains passing through as it's on the main line from Regio Calabria, "the toe of the boot" of the peninsula, to Napoli, Roma, and points north. 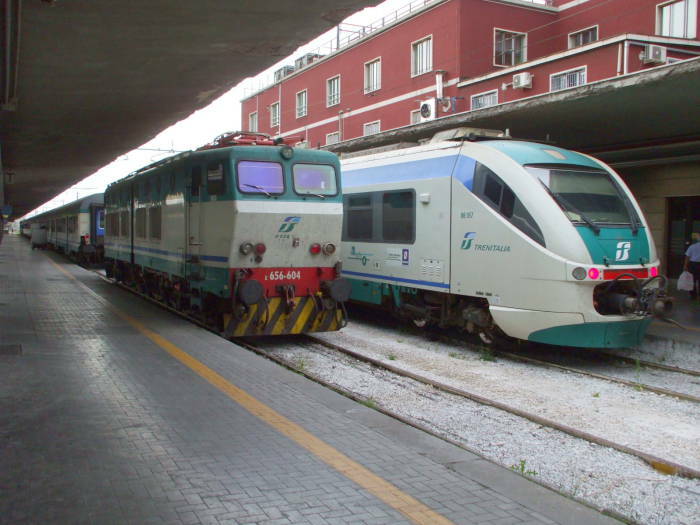 The short self-powered train in the first picture would be used for shorter trips, like between Salerno and Napoli. That takes just about 30 minutes and €3. 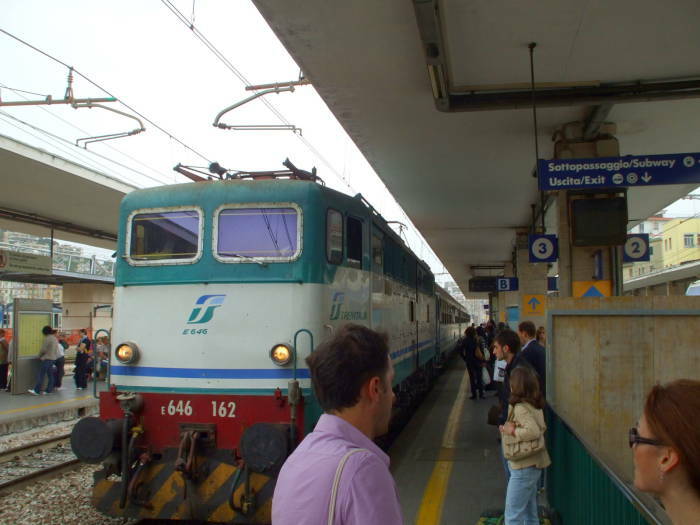 The second picture shows a more old-fashioned intercity train. 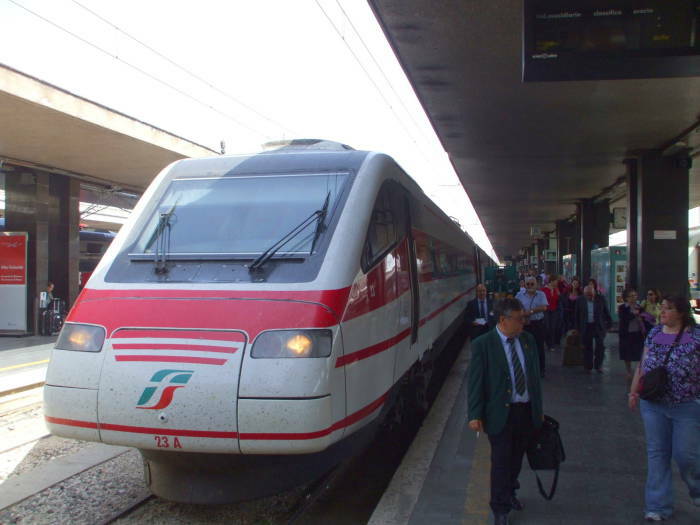 Here are more intercity trains at Roma Termini. 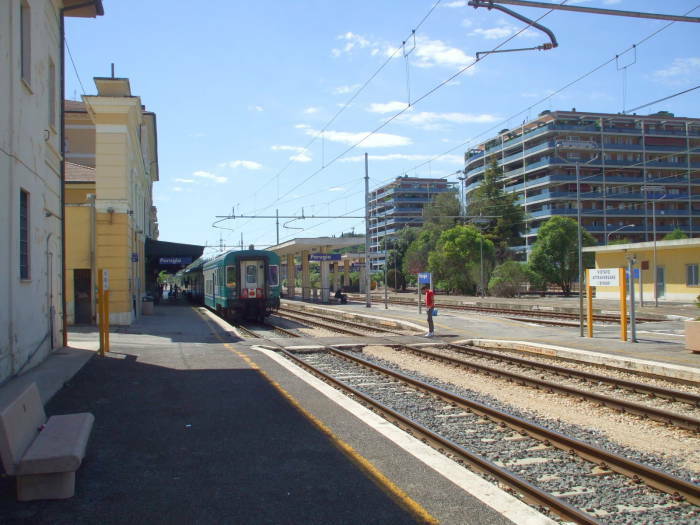 This is the station in Perugia. 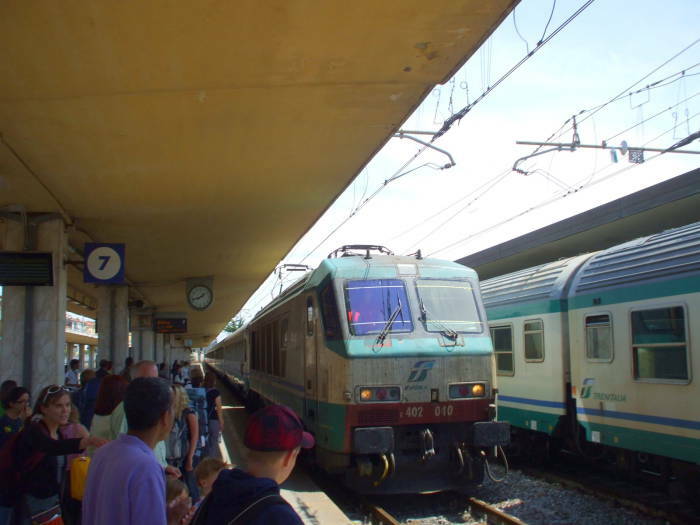 Perugia has, by Italian standards, limited train service: some times you might have to wait up to two hours between trains. 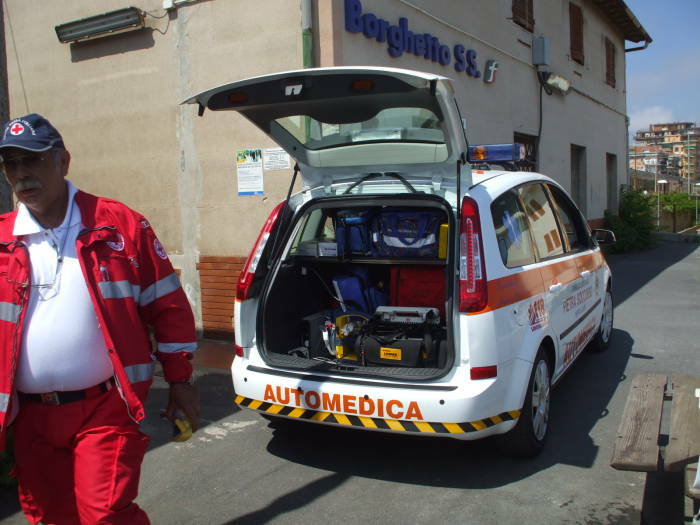 But usually there is service roughly every hour between Perugia and Florence. Compare this to the United States outside the two main rail corridors of San Diego — Los Angeles and Washington — Baltimore — Philadelphia — New York — Boston. The few cities with rail service mostly have a train passing through only every day or two. 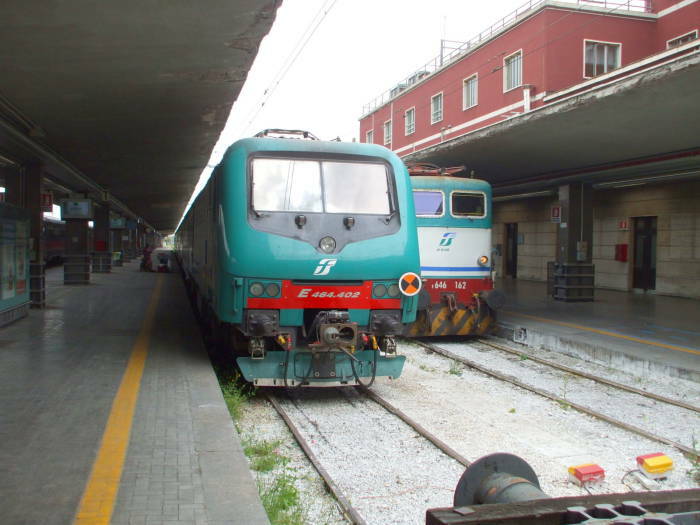 These are intercity trains typically used between Firenze (or, as English speakers put it, Florence) and Pisa. 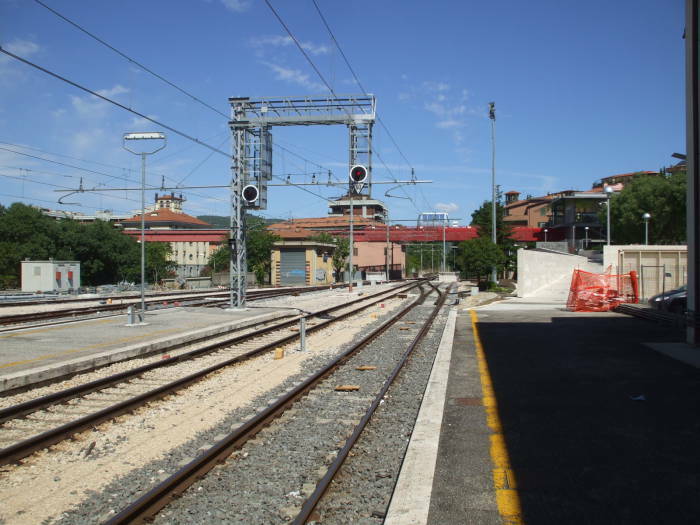 The main station in Firenze is often abbreviated as Firenze S.N.M., standing for Firenze Stazione di Santa Maria Novella, referring to the large piazza in front of the station, and in turn, to the cathedral across that piazza. 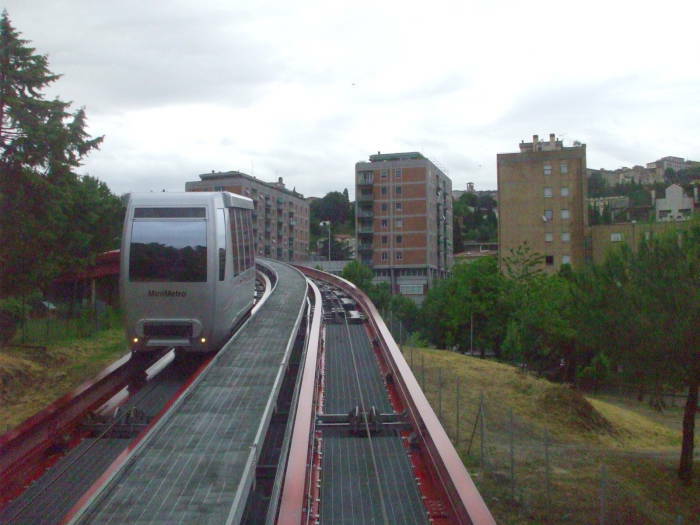 The city of Perugia has a completely automated futuristic transport system called the Mini-Metro. 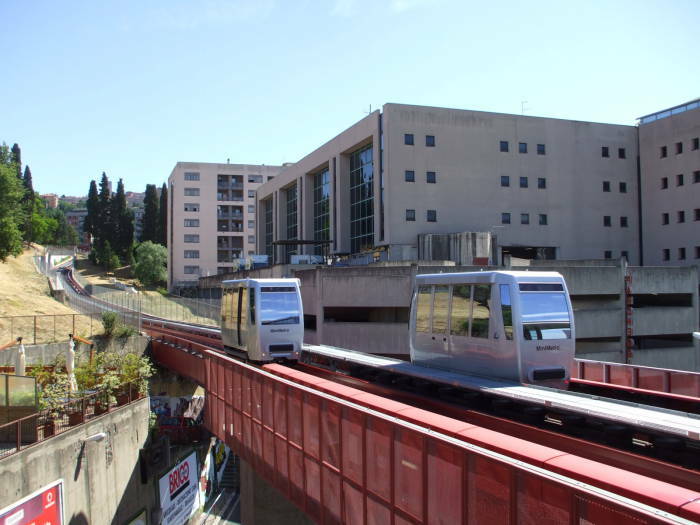 Here you see the Mini-Metro crossing over the rail lines at the main train station. If you're going to put up any signs in Italy, make sure you get it right or you'll incur the wrath of the Magic-Marker-wielding language sticklers. This sign from the Salerno train station attempts to tell passengers that, due to renovations, "Access to the platforms is through the new underground passageway from the public square of the station." The best collection of railways map I know of is the Railways Through Europe site. 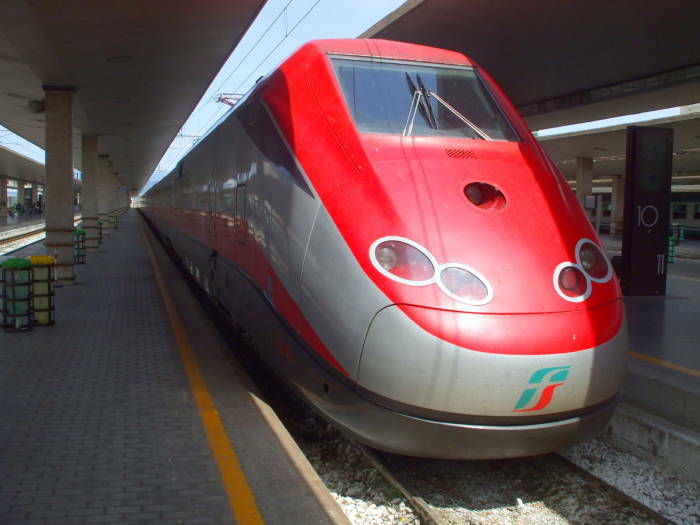 The Trenitalia web site is at trenitalia.it. If you are curious about the on-board plumbing, see my collection of Italian train toilet pictures. 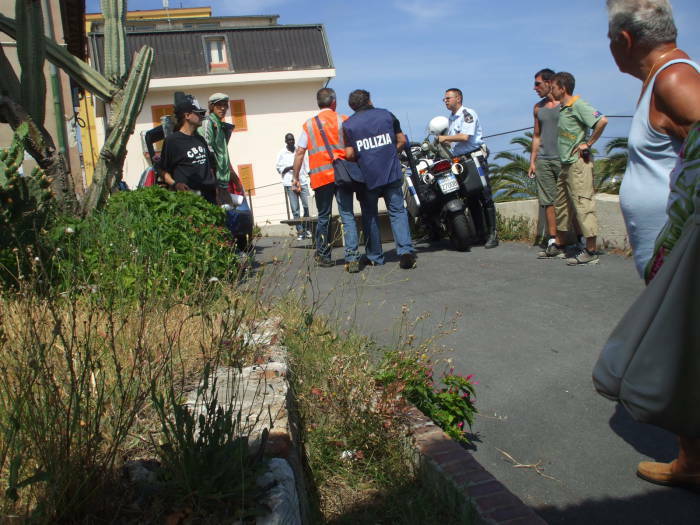 We were on a trip scheduled to take much of the day, from Genova to Marseille. 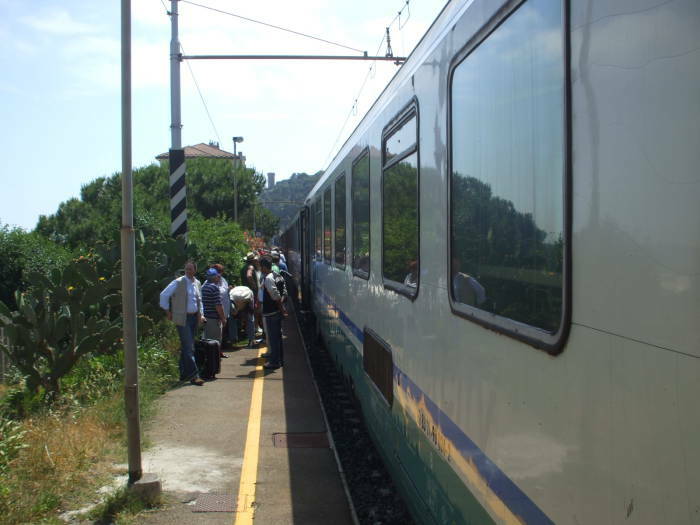 But the train suddenly stopped at the small seaside town of Borghetto Sancto Spirito Savona. Word passed quickly down the train that we might as well get out as we would be stopped for a while. 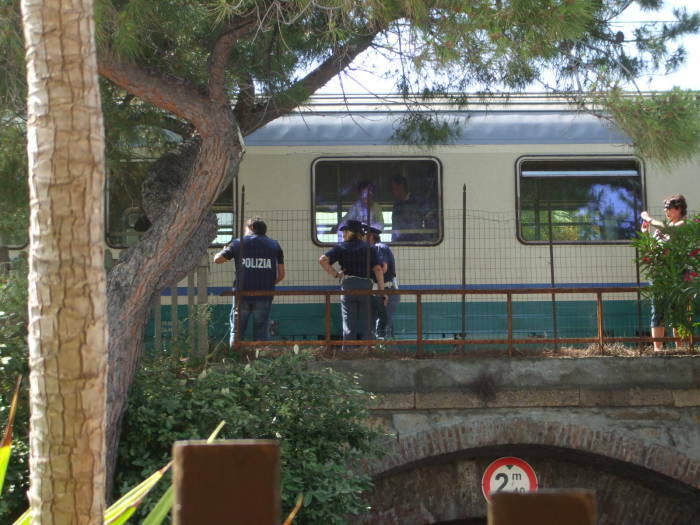 The police showed up quickly with sirens wailing and hurried up to the train. 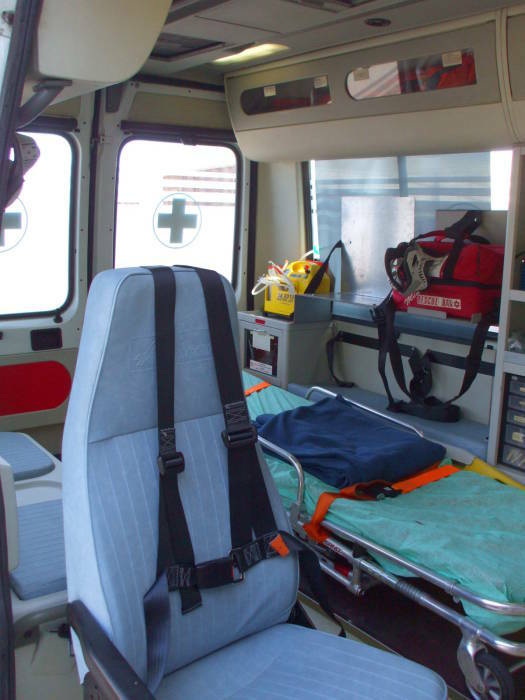 Then the emergency medical workers showed up with their lights and sirens going, but then they took their time organizing their equipment and walking up to the platform. 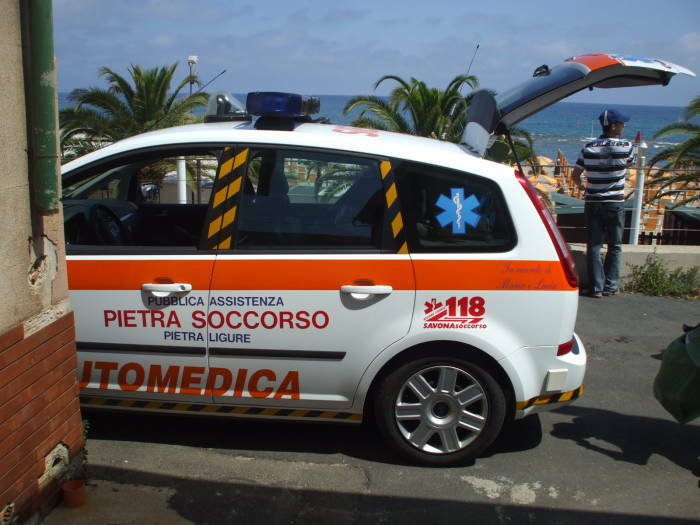 Hurrying police and casual paramedics — not a good sign. Yes, the train had run over someone. 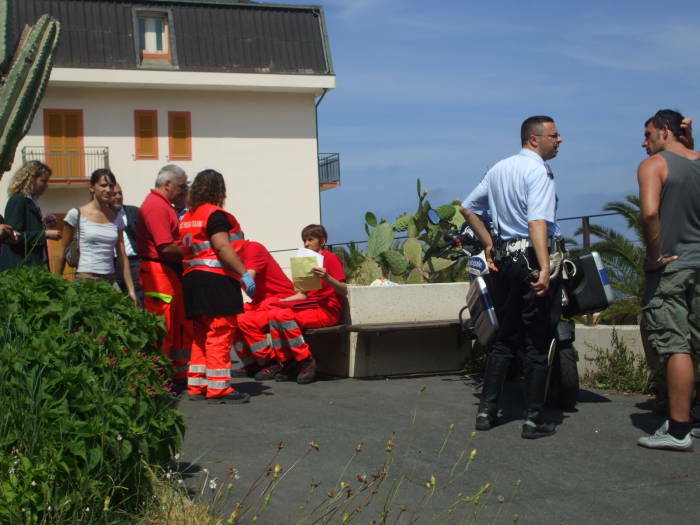 A suicide had jumped off the platform right in front of the engine. I figured that out by watching one of the police officers explain the situation to some passengers, complete with an elaborate pantomime: It was not a murder (pushed) or an accident (fell), but a suicide (jumped). 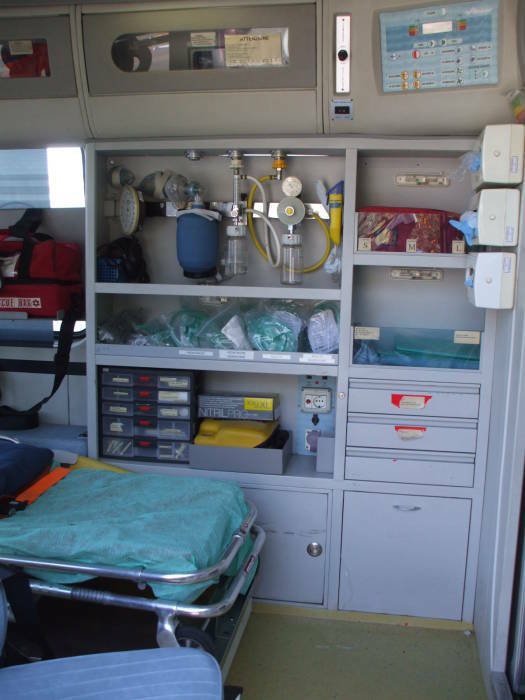 We were going to be there for a while, so let's check out the ambulance. 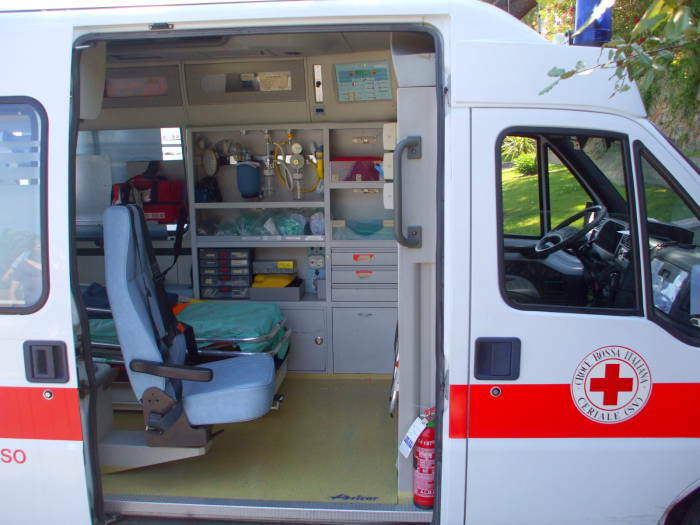 This is far more advanced than the Russian ambulances I've seen! We were ready to go after about an hour and a half of investigation, police photography, and work by the morgue attendants.